We arrived home late Canada Day afternoon and I was overwhelmed by all the things that needed to be dealt with (lawn, weeds, pool, groceries, laundry). I knew there would be, and I would have liked to have just carried on. 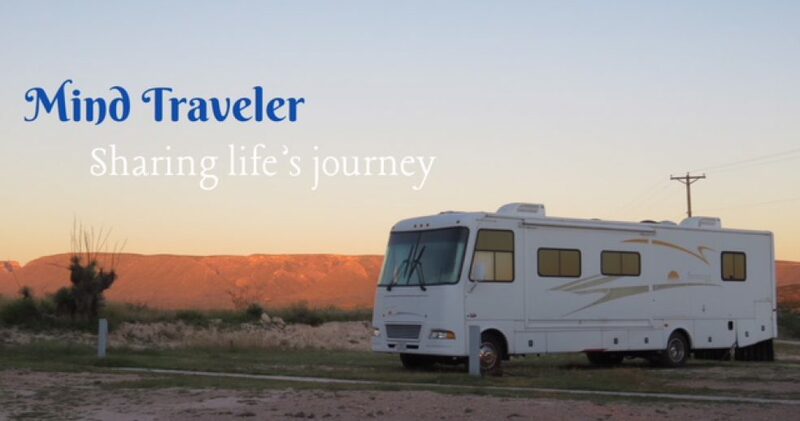 Full-time RVing is becoming more and more appealing to me. 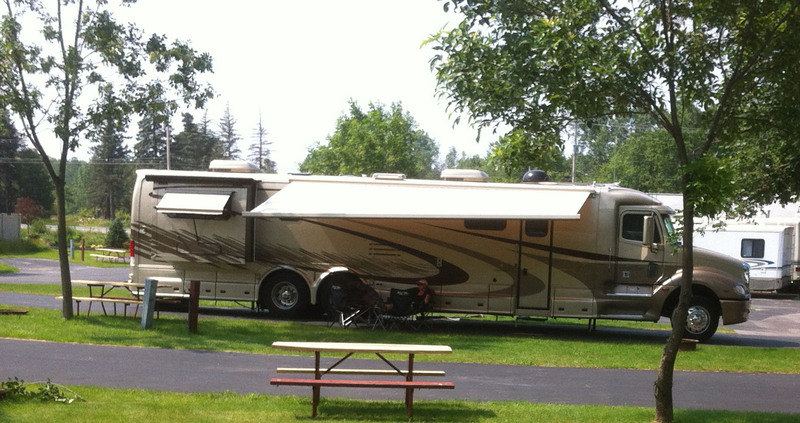 We had left Genesee Country Campground in Caledonia, NY on June 23rd, suddenly into the hot, humid weather of summer. I didn’t want to disappoint my girlfriends back home who enjoy bargain shopping, and Jim and I were both in need of new sandals, so we decided this would be a good day to hit the air-conditioned Outlet Mall in Niagara Falls, NY – our last chance before crossing the border back into Canada. Two hours later we struggled to carry our purchases all the way across the parking lot to the RV! Good thing we hadn’t decided to camp first and take the bike to the mall! We spent the evening in the air-conditioned RV, parked at the AA Royal Motel & Campground and watched in amazement when this 48 ft. condo-on-wheels pulled in, two spaces away from us! In the morning we drove into the Goat Island Niagara Falls State Park for some picture taking (parking was only $5.00 for our rig and trailer) before filling up with gas and heading across the border without incident. It was another hot and sticky day. We were expected at my Uncle’s in Kitchener that afternoon, but Jim decided we should spend some time in Niagara Falls Canada. 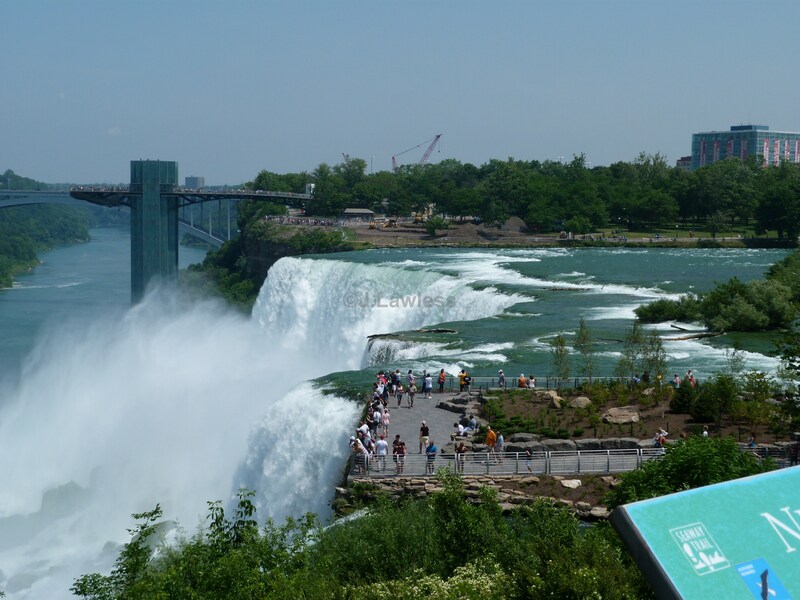 We couldn’t find a parking spot anywhere near the falls, and if we had it would have cost double that on the US side. We finally found an abandoned arena parking lot at the top of Falls Avenue hill and decided to take our chances. It was way past lunch time. We enjoyed salads on an outdoor patio while listening to the live entertainer. 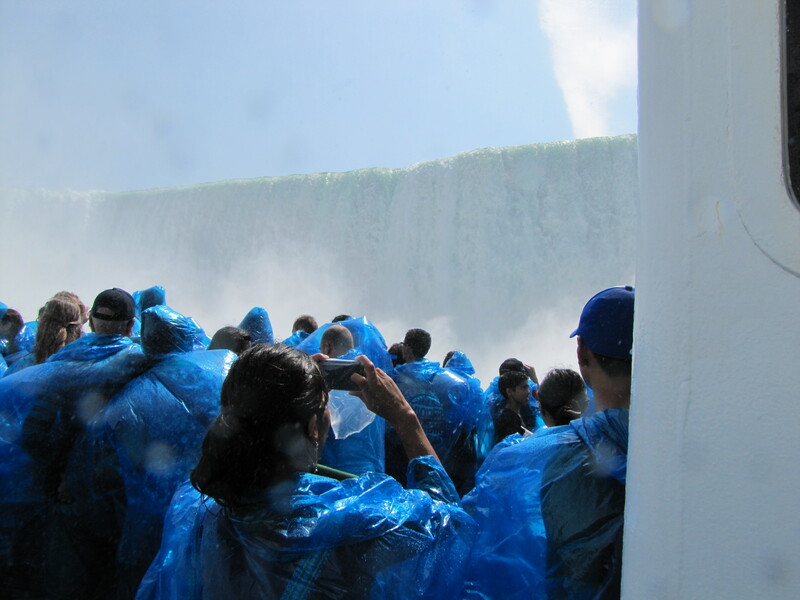 Then we went back down to the falls, took more pictures and got cooled off under the falls on the Maid of the Mist. Ice cream cones on the way up the hill saved us from cooking before we made it back to the RV and we were off toward Kitchener. It was seven o’clock by the time we arrived and my poor uncle was getting quite worried. Because of little or no internet connection for the rest of our trip, I had to put blogging on hold. That’s a problem that I need to sort out for next trip. We spent the night in the RV parked in Uncle Nelson’s driveway, and were away by nine the next morning, heading north to Wasaga Beach. Thanks to Jim for the Big Rig and Maid of the Mist photos. 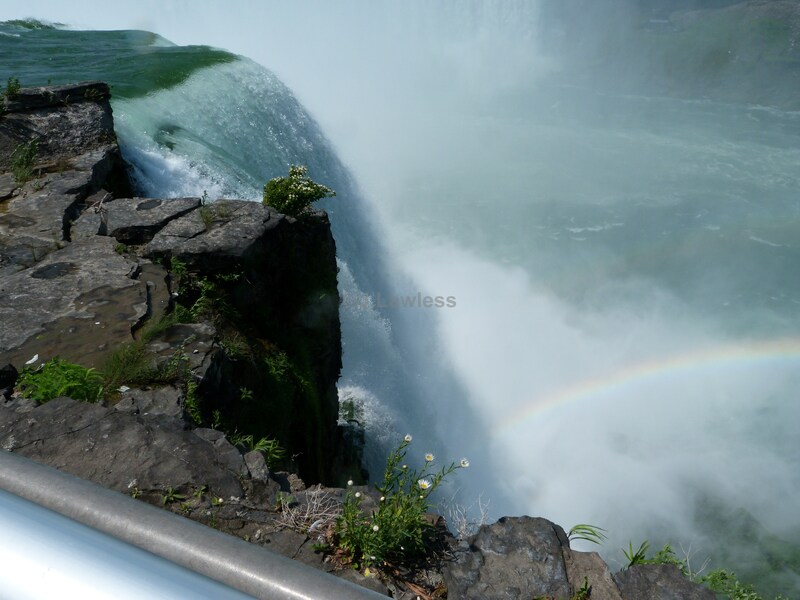 This entry was posted in Photography, RV Travel, Travel and tagged Maid of Mist, Niagara Falls NY, Niagara Falls Ontario, Photography, RV Travel. Bookmark the permalink. Glad your home safe and sound – you must be tired but what a nice time of year to tour when things are so green. 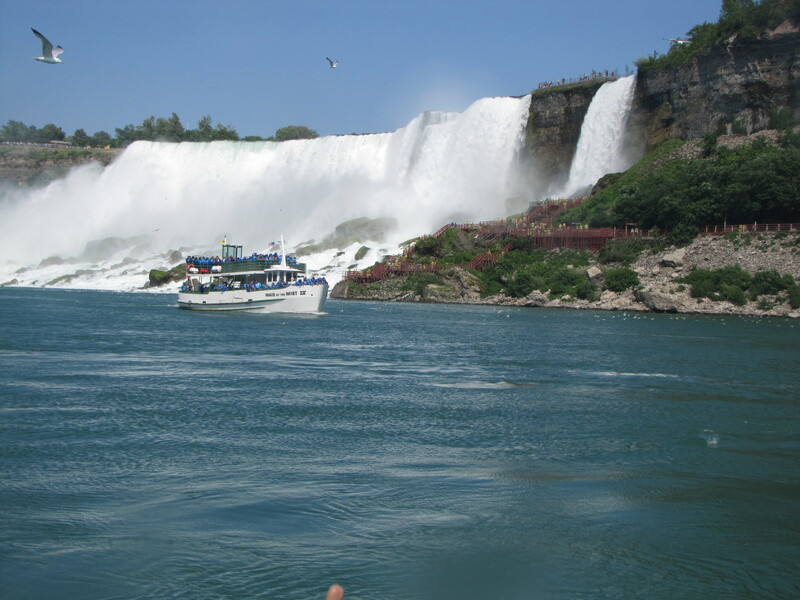 Nice pictures taken at the Falls. I am looking forward to Thursday and getting away to the west. I was talking to John Stewart today and I hope to get a few minutes with him when we are in Calgary. I have my little book and CAA road maps of Manitoba/Saskatchewan and Alberta/BritishColumbia ready to send to David. Thought he might find the road maps interesting. Thanks Uncle Nelson. Enjoy your trip west and say hi to everyone out there for me.safe travels.